UNDER CONSTRUCTION: CHEERS TO THE NEW YEAR CARDS! I'm going to tell you something that I poorly attempted to keep a secret for years. One of my best friends Brittany Ross also cheered in high school and college and on most scripted shows on TV. And some movies. Not only is she a brilliant comedic actress, Brittany is a friend who makes everything better... sometimes times just by looking at her. And it's not just because of her beautiful face, she is an awesome friend. Who happened to ask my advice on New Years Cards. Cheerleading was the theme and easy was the name of the game. Purchase fold over cards and matching envelopes of the size and color of your choice. 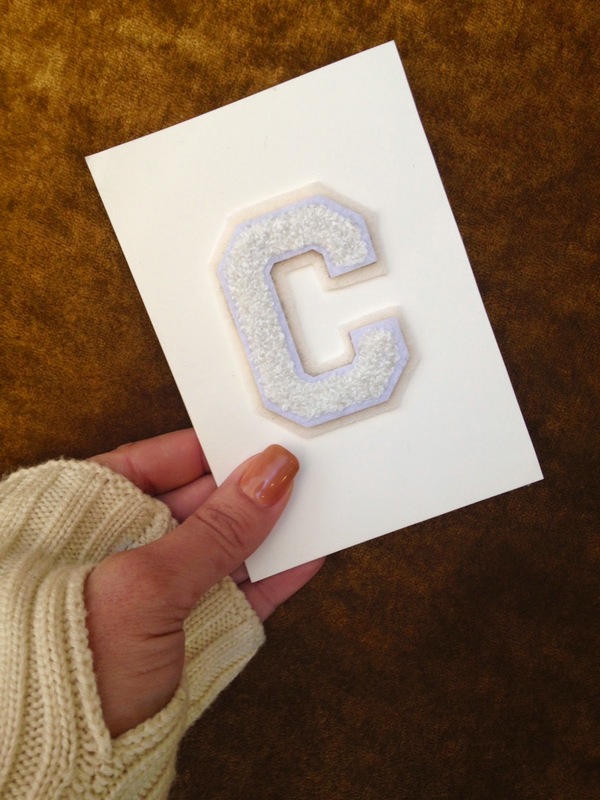 I attempted to make my "C" from scratch but that didn't go well so I bought it at M & J Trimming, ripped off the black backing and replaced it with IVORY felt because heaven forbid I make something that isn't beige. To utilize the alphabet I would put the recipient's initial on the front. Sign it. Stick it in an envelope and high kick all the way to the mailbox. Brittany's reaction to the card idea. Brittany's final product definitely lifted my spirits when it arrived in my mailbox. My enthusiasm for snail mail cannot be suppressed.